Last week, I wrote a piece about music festivals and their relationship with cask ale. So to continue with this theme, this week I’m writing about the daddy of all beer festivals. The CAMRA Great British Beer Festival (GBBF) is taking place next week at Olympia from the 8th to the 12th August. The first “proper” Great British Beer Festival was held back in 1977 at Alexandra Palace which means this great British institution is celebrating its 40th birthday this year (by the way, fact finders, if you turn 40 during the Festival dates you gain free entry and free pint). 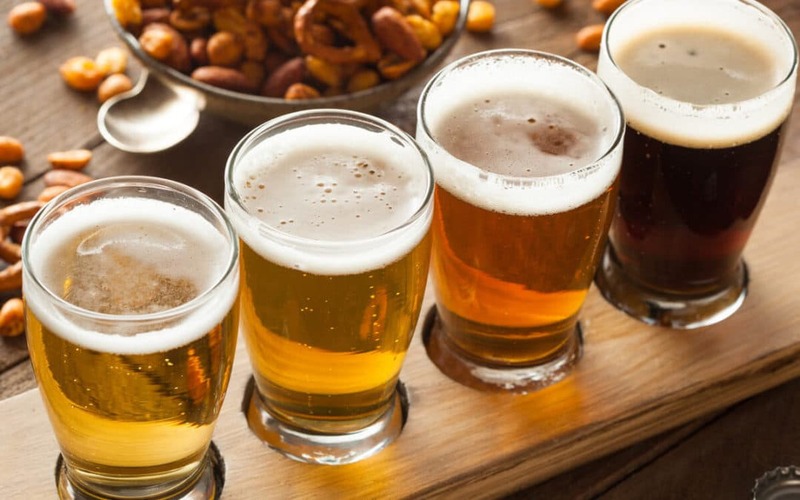 Each year, more than 50,000 people travel to London from around the world to sample not only the 900 cask ales which are on offer, but also cider, perry, bottled beers from around the world and gulp – for the first time – English wine. If you’re a beer lover, going to GBBF is something you should try at least once in your life. For the uninitiated, here’s a snapshot of what to expect. The phenomenal noise as you enter the main hall: Olympia is not renowned for its world class acoustics and it’s like being in a giant swimming pool. Even the quietest voices bounce and echo, and every few minutes there is a phonic tsunami, a ground swell of cheering. When you add beer into that mix, top it up with regular tannoy announcements and a metal band on the stage, the volume increases tenfold. Communication is only possible by bellowing at the top of your voice. If you haven’t lost your voice by the end of a session, you haven’t had a good time. This somewhat scuppers the announcement of the Champion Beer of Britain which no one ever hears amongst the bedlam. A complicated system of sign language usually ensures news of the winning beer is imparted to the partially deaf within ten minutes. Which is about the time it will take for the beer to sell out on the bar. The sheer size of the festival: it’s a labyrinth akin to a market place in Marrakesh. Just when you think you’ve navigated the layout, you find another area awash with more beer stands. It’s disorientating in a fun kind of way: you pass the brewery stands confidently heading for the Belgian beer bar, walk for ten minutes in what you think is a straight line, and then confusingly, you’re back at the same brewery stands. How does this happen? Is it some kind of sorcery? Best laid plans: on entry, everyone is handed a Festival glass and programme. With the best of intentions, you flick through the Guide, earmarking the beers you want to try. Heading in the general direction of Stand ‘E12(2:1)Area G’ (sorry, I jest), you spot an interesting pump clip and stop for a half. Glass drained, you set off again, only to be stalled once more. Have a plan by all means, but just don’t expect to stick to it, it’s nigh on impossible. General all round silliness: roaming gangs of blokes in Victorian fancy dress; random male voice choirs from the Valleys; the tradition of ‘Hat Day’ on the Thursday where everyone looks vaguely ridiculous in their ker-razy drinking hats. It’s almost impossible for me to pick a Something for the Weekend beer this week with all of this to look forward to. Although, if I’m pushed, I’m going to start off with a beer I can’t get hold of round my neck of the woods. A Harvey’s Sussex Best Bitter, from Lewes. A former winner of the Champion Best Bitter of Britain title at GBBF in 2005 and 2006, it’s the perfect starter beer for me. I’m delighted that this brewery has a dedicated stand at the Festival (which means I’ll *probably* find them). Having looked at the food available at this year’s GBBF I’m going in for a traditional transportable beer blotter – some Bighorn Biltong made from rare breed, grass fed British beef.